Found this on my computer, apparently written in 2010. I guess I never posted it before because I didn’t decide on an answer to the question it poses: what is it that simulation games of very different subject matters have in common? I still am not sure what I think about that, but I think the question is well-posed so I’m posting it here. A few months ago, I revisited an early Sid Meier game, Silent Service 2 (you can too). 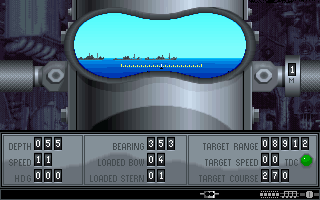 It’s a submarine combat simulation set in the South Pacific during WWII. Your boat takes off from an American port and then spends weeks in the field, hunting Japanese shipping and battle groups. You have to decide how far out from port you can wander, how to ration out your limited supplies, and what sorts of targets you can afford to engage over time. You also have to control your boat’s movement and weapons as you engage each target. My thoughts while playing SS2: why is this a Sid Meier game? Where does it fit in the oeuvre that most prominently includes the Civilization series? One answer is that it doesn’t — Sid Meier made some combat flight sims, too, and they don’t have anything to do with Civilization (perhaps). But it feels like the planning and strategy of SS2 are related to the planning and strategy of Civilization and its successors, even if you in Civ you never pilot any vehicle or really fight. I guess what I’m trying to figure out is, what do strategy games have in common? It’s not about the subject matter. What do generalizations like “planning” and “resource management” actually describe, and why are they so addictive?